B and B Used Auto Parts offers daily (Monday –Friday) parts delivery to our local wholesale customers. * With multiple trucks distributing locally and regionally, our professional drivers are dedicated to delivering your parts on time and in excellent condition. Call us today for availability in your area! Our delivery and shipping team is very efficient at getting your orders processed, packaged and out the door to you quickly and safely. We ship daily (Monday – Friday) via major carriers to most US cities. Call us for rates and availability in your area. * Call for complete details & availability in your area. B and B Used Auto Parts is a full service auto salvage yard located in Charlotte, NC. B and B Used Auto Parts locally serves most of NC, parts of SC & VA as well as the entire US via nationwide shipping including: Charlotte, Mecklenburg County, Greensboro, Winston Salem, Asheboro, Salisbury, Mooresville, Kannapolis, Concord, China Grove, Lincolnton, Gastonia, Huntersville, Cornelius, High Point, Siler City, Indian Trail, Mount Holly, Rock Hill, Kings Mountain, Lancaster, Rockingham, Spartanburg and other surrounding areas. B and B stocks thousands of late model used parts for cars, trucks, vans and SUVs including: Engines, Transmissions, Axles, Rear Ends, Starters, Alternators, A/C Compressors, Radiators, Wheels, Tires, Auto Body Parts including: Front Ends, Hoods, Fenders, Grilles, Front Bumpers, Headlights, Doors, Taillights, Rear Bumpers, Deck Lids, Interior Parts and almost any used part on a salvage vehicle. 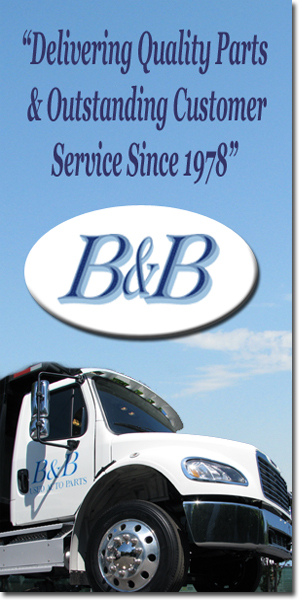 B and B Used Auto Parts Charlotte, NC wholesale delivery & nationwide shipping.